For its third season Troy Baseball and Softball Fan Day was a hit even before the Super Bowl that came a few hours later. Last Sunday, Feb 3 Troy fans were given the opportunity to meet the 2013 Trojan softball and baseball teams at Riddle-Pace Field. Fans lined up to get team schedule posters signed by all the Trojans with both the baseball and softball seasons close approaching. Free hotdogs and drinks were provided to all the fans who attended the fan day event. Fan Day came at the end of a weekend full of intersquad games for the Trojan baseball team that played scrimmages on Friday through Sunday. 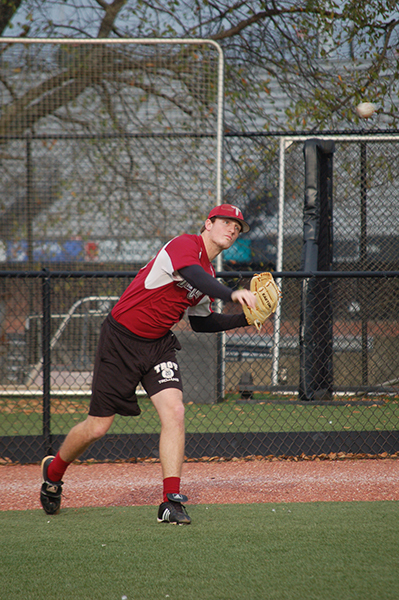 For the Troy hitters, it was time to shake off the cobwebs and get ready for spring baseball. In the game on Friday, Feb 1, senior third baseman Logan Pierce gave the Cardinal team a 1-0 lead in the top of the 1st with his RBI single that scored Tyler Vaughn, who had walked to leadoff the inning. The Black team was held scoreless by the Cardinal pitchers of Will Starling, Robert Price and Ivan Carter. Cardinal hitter T.J. Binder’s RBI single in the top of the 5th would make it 2-0 Cardinal but it was Pierce’s RBI sac fly followed by Kyle Brown doubling in another runner to make the score a definitive 4-0, which would hold. “I felt like that pitching was a little ahead of the offense.” Coach Pierce said. Saturday’s intersquad game was full of fireworks as the Black team took down the Cardinal team 12-4. Speedy Troy outfielder Ali Knowles had an impressive game offensively going three for three with two doubles, a triple, a walk and three RBI. Cardinal team catcher Jake Harrell got to take his time around the base pads in the bottom of the 4th when he hit a three-run home run that cut into the Black team’s 7-1 lead to make it 7-4. Black team pitcher and third baseman Matthew “Muggsy” Howard had a productive day at the plate when he crushed a towering solo home run high over the fence in the left in the top of the 5th to make it 8-4 Black. The wheels really came off for the Cardinal team in the top of the 6th when the Black team hitters scored four more runs to make it a 12-4 rout. But the Black team would answer in the top of the 5th in the form of a Danny Collins RBI single to make it 3-2 Black. Cardinal would end up winning 4-3 but one of the things that stuck out in the game was the command issues of right-hander Joe Hernandez, who walked four batters in the 4th despite striking out four through two innings of work and allowing one hit, a single to Trae Santos. “There are always some bright moments and some things that you get a little concerned about but for the most part, I felt like the guys are getting kind of ready to open a season,” Coach Pierce said.